Are you aware that 121 students are homeless in our school district? In our local towns? At the end of the 2010-2011 school year, 301 students were homeless in our district. The number this year will continue to rise. What can I do? What can you do? We can start with what is right in front of us. 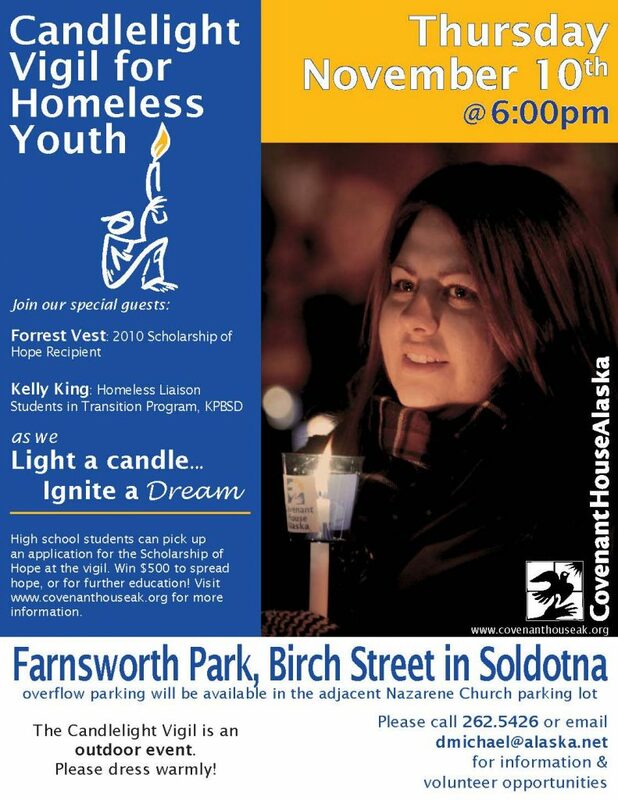 Thursday, November 10, 2011 | 6:00-7:00 p.m. Together we will learn about local agencies that offer support (and need suppport), and the KPBSD “Students in Transition Program for Homeless Children and Youth.” Students who attend will have an opportunity to apply for a $500.00 Scholarship of Hope. Beginning Wednesday, follow a series of articles in the Peninsula Clarion concerning teens who are homeless in the Central Peninsula. Take a step–maybe a step you don’t want to take. Share awareness, show up. You matter–we each matter. This entry was posted on November 8, 2011 at 1:30 pm. You can follow any responses to this entry through the RSS 2.0 feed. You can leave a response, or trackback from your own site. 4 Responses to "Share awareness: students are homeless"
Thank you, Pegge. You stated my feelings on this exactly with the words “show up.” These students need people to show up for them – at the vigil and in life. Awesome blog Pegge!! My wife and I are very greatful when we come across someone with similar concern for kids. Pegge, Thank you so much for bringing awareness to the struggle that a number of our teens are facing from day to day. We need caring people in our community, such as yourself, to step forward and “do just 1 thing” to combat this issue. The first “thing” is awareness so, Thank you. Thank you Kelly, Dave, Debbie, and Heather–you each make a difference, and are doing more than the one thing. Thank you! You can also see it from the homepage.